Anisec promotion from Vienna to European cities from 2 cents return! Cheap flights from the UK to New York, USA from £217 return! Cheap multi-city open jaw flights to Australia & China £408/€508! Low cost carrier Anisec (Austrian subsidiary of IAG family – British Airways) have opened new base in Vienna. In this occassion they offer extremly cheap one-way and return flights to / from Vienna to cities such as London. Barcelona, Paris, Bilbao, Mallorca, Ibiza, Malaga, Alicante, Milan, Venice. Olbia, Larnaca, Valencia or Dubrovnik. At this momenht you can book super cheap return flights already for 2 cents! (See below our booking sample from London to Gatwick to Vienna). This is for a round trip and inclusive of all taxes and fees. Fare is including hand luggage and one small bag. Hurry up this amazing offer will surely not last long! (Flights are operated by Anisec). 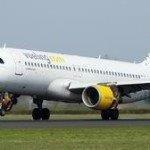 Booking is only possible here directly with Anisec / Vueling. Look for flights in August and September 2018. Very limited seats on each date so hurry up with your booking if this is a deal you like! You can try to book this deal via mobile as their site is very slow at this moment due to high demand..
Booking sample of Anisec promotion from Vienna to European cities from 2 cents return! 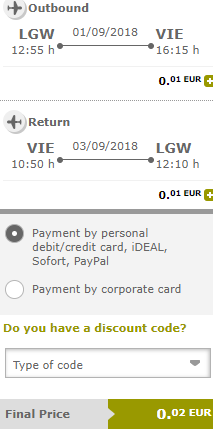 In this case you would depart from London Gatwick to Vienna on 1st of September. Inbound flight from Austria back to the United Kingdom on 3rd of September 2018. Do not miss this crazy low priced promo sale across Europe no matter where you live..such a crazy deals are very rare..